Peterjon Cresswell visits Tynecastle, the historic home of Hearts, Scotland's third most successful club. 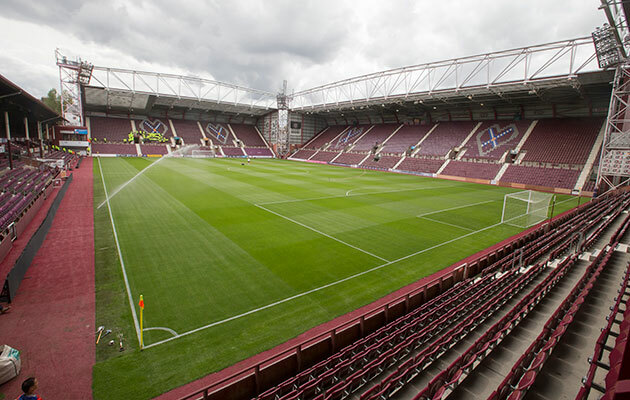 Tynecastle, Hearts-Aberdeen, Scottish Cup, Sat Jan 9, 5.30pm. Returning to the Scottish Premiership in 2015 after nearly going under completely in 2013, Heart of Midlothian are the third most successful club in Scottish League history, pipping Aberdeen to a podium spot way behind Rangers and Celtic. The club’s modern-day history is mostly tainted by the irresponsible ownership of ex-Soviet millionaire Vladimir Romanov. Extrication from his disastrous clutches has been a complex and near fatal process. His reign ended in 2014, on the centenary of the proudest campaign in the club’s history. Heart of Midlothian, a local dancing club whose members adopted association football in 1874, had risen to prominence in the 1890s, overshadowing city rivals Hibernian. Set in the club’s heartland of west Edinburgh, Tynecastle became Heart of Midlothian’s first permanent home in 1886. Before then, Hearts had moved around Edinburgh, playing the first derby with Hibs at the Meadows, south of town, in 1875. With banked terracing, capacity was already more than 60,000 by the time renowned stadium architect Archibald Leitch created a main stand in 1914. Starting with eight straight wins, the team of 1914-15 was looking to claim a third Scottish crown for Hearts when duty called on the battlefield. With key players enlisted, Hearts lost out to Celtic at season’s end but kept an emotional link with the fallen men of 1914. The next great Hearts side came in the 1950s. Managed by ex-Hearts inside-forward Tommy Walker, Hearts claimed two championships, a Scottish Cup and four League Cups. Behind this success was the Terrible Trio of Alfie Conn Sr, Willie Bauld and Jimmy Wardhaugh, first fielded as a forward line by Walker’s predecessor, Davie McLean in 1948. With managerial assistant Walker in place after McLean’s sudden death in 1951, and a young brave left half, Dave Mackay, emerging, high-scoring Hearts romped to their first title of the 20th century in 1958, repeating the feat two years later. By then Mackay had gone to Spurs and the young stars of 1960, striker Alex Young and left back George Thomson, would soon follow him south, to Everton. During these glory years, with concrete terracing, Tynecastle’s capacity was capped at around 50,000. Long eclipsed by the Old Firm, Hearts were relegated for the first time in 1977. Form improved with the funds of incoming chairman Wallace Mercer – but not fortune. Hearts went into the last game of the 1985-86 campaign needing only a point to pip Celtic to the crown. Holding Dundee at 0-0, Hearts fell to two late goals from substitute Albert Kidd, while Celtic were hitting five past St Mirren. Goal difference decided the title. Infrastructure also improved under Mercer before post-Hillsborough developments saw new stands built on three sides. The Mercer era was long gone by the time Russo-Lithuanian entrepreneur Vladimir Romanov arrived in 2004. With the club close to selling Tynecastle, Romanov juggled huge debts between his various companies. Capriciously sacking manager George Burley after eight straight wins early in the 2005-06 campaign, Romanov brought in his son Roman as chairman. With unpaid wages and unpaid taxes, Hearts went into administration in 2013, punished by a transfer ban and 15-point penalty in the league. 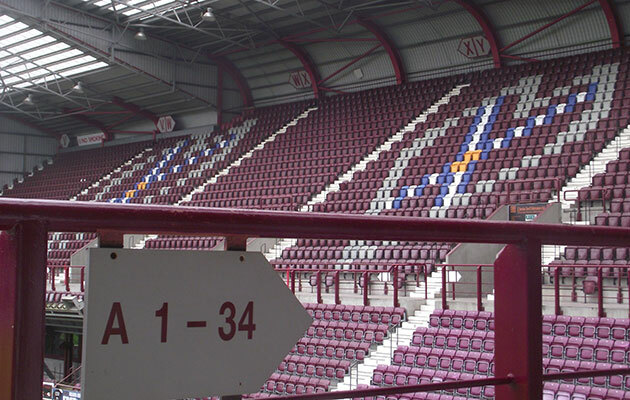 Some 10,000 fans bought season tickets to keep the team going while many donated to the Foundation of Hearts, a supporters’ group who reached agreement with the club’s creditors. Despite the inevitable relegation, Hearts were rescued by consortium Bidco 1874, working in tandem with the Foundation. On the pitch, a young side under manager Robbie Neilson beat Championship favourites Rangers in the first game of 2014-15, and kept on winning. Crowned second-flight champions in March, Hearts won their first five Premiership games of 2015-16 and look set for a European place. Still in scoring form is promising attacking midfielder Jamie Walker, who broke into the first team as a teenager during the club’s transfer ban. Currently the stadium capacity is just under 18,000, housed in the Main Stand, as designed by Leitch a century ago, the Wheatfield Stand opposite, and the Gorgie and Roseburn Stands behind each goal. Away fans are allocated the Roseburn, through turnstiles 23-32. Tynecastle is across the rail tracks from Murrayfield rugby ground with its own stop on the Edinburgh tramline. The stop is by Roseburn Street, so handy for away fans. Alternatively, from Haymarket station, the stadium is a 15-minute walk or short hop on frequent Lothian bus Nos.3, 25 or 33 from stop HF on Dalry Road, which leads into Gorgie Road. The nearest stop to the stadium is After Newton Street. Ticket information is found at www.heartsfc.co.uk/tickets, purchase via www.eticketing.co.uk/heartofmidlothian. 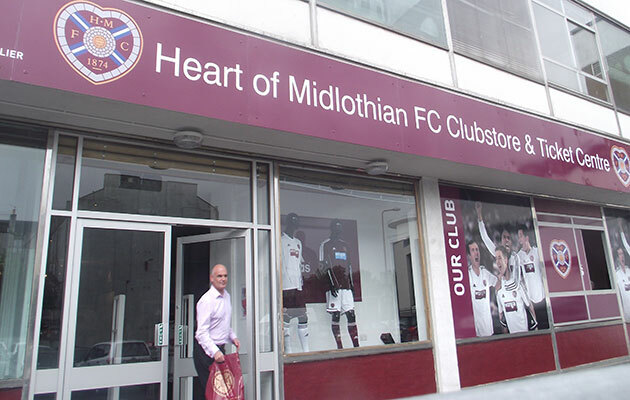 The Hearts Ticket Centre (Mon-Fri 9am-5pm, Sat 9am-4pm and match days), in the club shop on McLeod Street, also distributes. Items at the Hearts Clubstore (Mon-Fri 9am-5pm, Sat 9am-4pm and match days) include the fans’ tribute strip, with the names of Foundation pledgers across the shirt, and merchandise – scarves, mugs, coasters – celebrating the Championship win of 2015. In a sad sign of the times, definitive Hearts pub Robertson’s, once run by the ex-player of the same name and full of memorabilia, was reopened as a restaurant. Increasingly used as a pre-match bar, the Caley Sample Room on Angle Park Terrace parallel to Gorgie Road allows you to explore scores of craft beers and cask ales, complemented by a full menu and TV sport. At the cemetery end of Angle Park Terrace, the Athletic Arms aka ‘The Diggers’ is a pre-match bar par excellence for home and away fan alike, with recommendable local beers and football on TV. Between the two, the bar of the Ardmillan Hotel www.ardmillanhotel.com/ is also busy on match days. 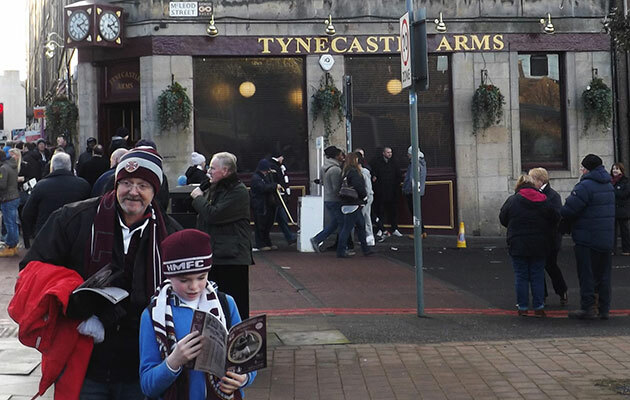 The nearest pub to the ground is the Tynecastle Arms, an honest local with plenty of TV sport, acoustic music nights, good choice of bottled beers and match ticket offers. Everything you need in a pre-match bar, in fact.